API Stress Coat Plus instantly makes tap water safe for fish. It's made with Aloe Vera, nature's liquid bandage, to prevent the loss of essential electrolytes and protect damaged tissue by reducing stress and restoring the fish's natural slime coat. Stress Coat Plus replaces the natural slime coating fish need in times of stress (such as handling, shipping or fighting), and helps heal torn fins and skin wounds. Use when setting up the fish tank, changing water, or adding new fish. Benefits: Contains Aloe Vera, which promotes healing and regeneration of damaged fish tissue and forms a slime coat to help prevent electrolyte loss. 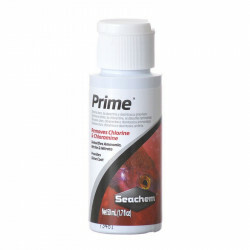 Proven to reduce fish stress, which can result from changing water, poor water quality and handling fish. High stress levels can cause fish to lose their slime coats and be more susceptible to illness. 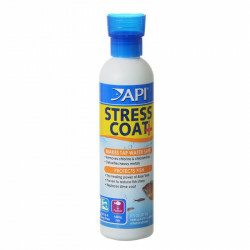 API Stress Coat+ is proven to reduce fish stress by 40%. When to Use: When setting up an aquarium, adding or changing water when adding new fish, or when fish are damaged or sick. Directions: Add 5 ml per 10 US gallons (38 L) of water or 1/2 cup (120 ml) for each 240 US gallons (912 L) of aquarium water. 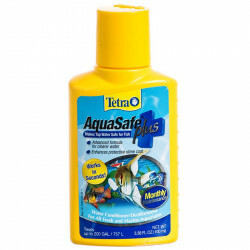 Double the dose to replace slime coat and to repair damaged skin and fins. Tip: Use Stress Coat together with API Stress Zyme to assure good water quality and a healthy, clean aquatic environment. 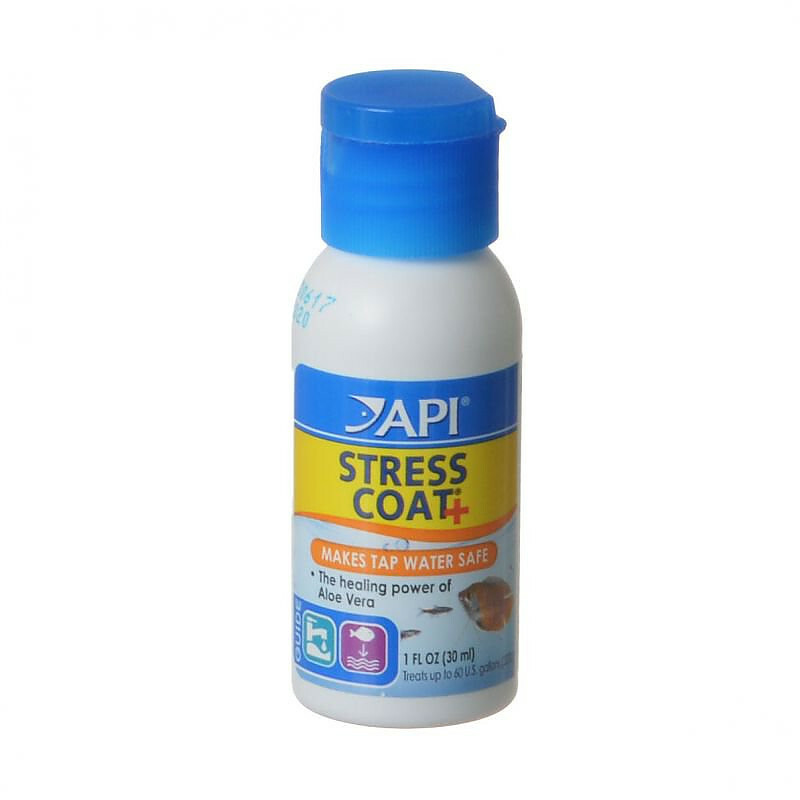 I have used Stress Coat for years because it keeps my fish very healthy. I was thrilled with the price that Petmountain had it for and will continue to buy the product from them. Thank you Petmountain!! We use with every water change and when adding new fish or medicating. I have used this product for a while and use it whenever I bring new fish into the environment, any time a net is involved, and with all water changes. Have used this in freshwater aquariums, helps to keep fish healthy. Was happy to find this in the gallon size at this price! Shipping was very prompt and it was wrapped so well there's no way it could have been damaged! Great product, great job! You can't beat their price & it comes shipped securely. Seems to be a good product and price. Only need half the amount of other water conditioners, so it goes further and cost less. When you have to change a lot of water, that is a big plus. This stuff works great for getting chlorine and chloramines out of tab water and provides a protective slime coat for fish when stressed. Good value too. This is best place to shop, good price, quick shipping and good service. We received the product without any damages. Perfect and a great price! Surprising, but good and great value price. This product is just perfect. I have found that my cleaning routine with both my fish tanks is made easier with this product because of its volume and measuring cup on the cap. My goldfish was not doing well Sunday, after we upgraded him to a 20gal tank. He was looking sick before we made the move and I think the move made him worse. He was very still on the bottom of the tank, not eating, and his tail was very shredded. He was also being sucked on by the algae eater in the tank. To stop this, we upgraded them to a larger tank and we added algae tablets to his diet. My local fish store recommended your product and add 10cc that night and add 10cc every morning until the fish was doing better. Miraculously the gold fish is doing great and is swimming around and eating again! Yay! I have been using this stuff for 5 years. When I first started with fish tanks I had one heck of a time with getting water quality good for my fish. I have tried many other brands and API is by far the best thing out there! I have 3 fresh water tanks and API is all I use from the stress zyme to help keep the tanks clean to the tap water conditioner for water changes! I have been using this product for a while now and have been really happy with it. Only thing that would make me happier with this was if it came with a pump so that it was easier to pour into the tank. Great price on it too. I use this after water changes and aquarium clean ups fish seem relaxed and very active afterwards. They did a great job packing it they taped the top with effort and wrapped it in plastic in case it leaked which it did not! So glad at the effort that was made. This is a great item! It is all you need for water change or new set up. It's always good to buy in bulk, I couldn't pass up this deal. Having 7 tanks from 2.5-150G I got through this quickly. What is there to really say about API products? I love them and I have never ever had an issue with it affecting my fish, plants or invertebrates. I use this every time I do a water change. always used this product for my 90 gal fish tank, and price was great! Excellent value, keeps pond and fresh healthy. I've been using Stress Coat for years, and will continue to. 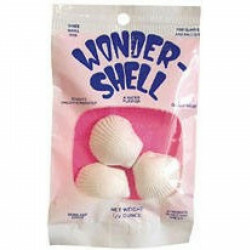 Besides using it as a water conditioner, I use it as a supplement to build and maintain the slime-coat on the fish. It doesn't leave any film or residue on the surface or cause the water to foam. Plus, it's cheap! Love this product! Great price too!!! I really love this product, I use it to condition the water when I have to top off my tank and to keep my fish healthy.Pet mountain has really good prices too! Since I started using Stress-coat my fish have lived much much longer and during tank changes, they demonstrate next to no stress at all. Great product -- easy to use. Use @ water changes/additions to eliminate chlorine. Also use it when fish appear sick or when adding new fish to the tank. Works wonders! I have a short piece of water hose off a yard faucet. Then I have a house water filter with a carbon cartridge that removes chlorine that I change once a month ( I have thirty trout size gold fish) and every time I do a water exchange or anything, I use water that I know doesn't have chlorine to kill the fish. When I do a water exchange ( I have three huge tanks in my front porch where I keep the fish) I feel I am protecting my 15 year old fish! But just to be sure, I always give a squirt of Stress Coat as insurance in case I had gone too long without changing the inline filter. City water systems fluctuate too much chlorine and sometimes tasting the tap water tells me it is really too strong. I have used this water filter for years. It is by Culligan and I bought it at the hardware store. It has a place for the short hose from the faucet for the tap water to go into the filter and another hose connection for the long hose to come out from the top of the cannister. I run it from the back yard, wrapped in foam insulated pipe 70 feet around to the front of the house and up through the floor of my porch deck, which is enclosed. The insulation keeps it from freezing in the winter. I love Stress Coat, it is my insurance. I can't live without it! I have three huge tanks in the front porch. The natural light comes in and I also have lights on. I always get passerby noticing my huge huge fish! How many fish can enjoy looking the deer outside and people walking by? The fish can also look into my living room from windows behind the tank and huge windows to the street in front of the tanks. The fish follow me when I am in the living room. They all turn and look at me watching tv. They say "Feed me, feed me! For the 3rd time today!". I go through a lot of stress coat. I use quite a large squirt, more than recommended. It seems pretty safe. I use this product every time I do water changes, adding new fish or just topping-off my 28G aquarium. Fish stay healthy and disease free. Petmountain sells these cheaper than local pet stores. Petmountain is great! This is a great product! I use this when I purchase a new fish, do a water change or when my fish are otherwise stressed out.